Feeling lost? 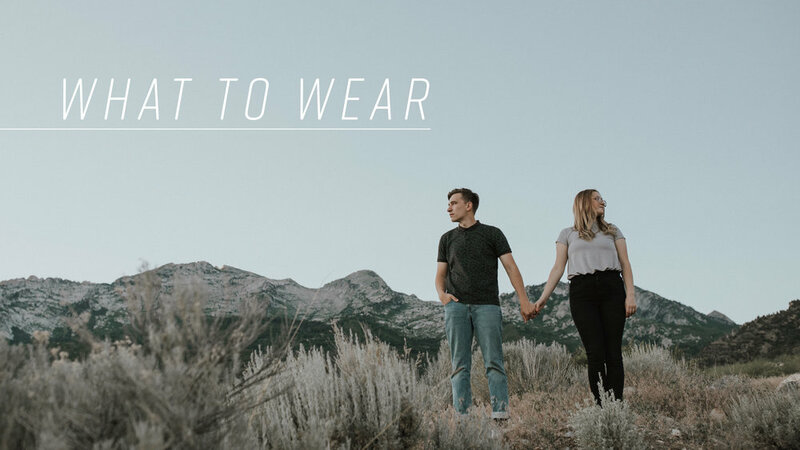 Here are some tips to help you pick out what to wear! Think about where we are going to be shooting in and plan around it. If we are going to be hiking around the mountains, bring shoes with good grip and you won’t twist your ankles in. If we are shooting on a sandy beach, it would look weird if you’re wearing shoes (ps heels are almost always a bad idea in most scenarios, unless you’re freakishly good at walking in them haha). If it’s freezing cold outside, bring lots of layers and warm clothes with wool socks and boots. If it’s going to be hot, bring clothes that can breathe more so you don’t have sweaty pit stains in the photos. Be as comfortable as you can be! Make sure that the materials you wear will keep you comfortable during the shoot not only for temperatures, but also for being able to move around in. If you're in brand new jeans that are still stiff and tight, you might be distracted during the shoot trying to make sure everything stays in place as well as lets you sit and run and move around in. I recommend bringing clothes that are "broken in" so that you'll be as comfortable as possible. I also love when people bring clothing or accessories that can show movement by catching wind, because it adds energy to the photos and looks absolutely gorgeous! Avoid big, loud, chunky, crazy patterns. The smaller or more subtle, the better! If the pattern is too loud, it will distract from your faces. Flannels are a good example of a subtle pattern that works! I usually try to avoid pairing too many patterns together because, you guessed it, it makes the photos feel a little hectic and distracting from your faces and the location. Also, be sure to iron your clothes before so there’s not huge wrinkles distracting from your faces either! When I think “props”, my mind flashes through all of the Pinterest photos I’ve seen of cheesy chalkboards and hobby lobby props brought to shoots that basically just make me wanna barf. But props don’t have to be cheesy! Props could be a dominos pizza picnic, a motorcycle, your dog (if you have a dog, I'm requiring you bring them), blankets, a truck/car, a campfire, a bouquet, a paddle board, etc. If you have props you wanna incorporate, let me know and we can make sure to incorporate them in a non-cheesy way! I will typically go for more neutral colors that will go with the environment rather than hot pink or fluorescent green that will distract from you and make the colors all crazy in the post editing process. I don't want only browns, whites, or grays. I love mustard yellow, burnt orange, navy blue, forest green, any of those variations always complement skin tones and our surroundings. I would stay away from red, bright orange, or pink in general because of the skin tones unless you have dark or olive skin. If you aren't sure about something, just ask me or take a look at my pinterest board for inspiration. Should you get your hair and makeup done professionally? My answer: “whatever will make you feel best, do that.” I absolutely don’t think it’s necessary whatsoever, because in my personal opinion, I would rather look like MYSELF rather than a super glammed up version of myself; especially because I wear pretty minimal makeup and a bun most days. If you want your hair and makeup done, then definitely do it, because the most important thing is that you feel confident like Beyonce always. If you’re getting hair and makeup done, I recommend you schedule to be done at least an hour before you have to leave for the shoot so you aren’t late. Also, if you’re whiter than toothpaste and want a spray tan, be sure to get a suuuuper natural airbrushed spray tan rather than one from a salon/tanning place. We don’t want you looking like an oompa loompa! If you have anymore questions, don’t hesitate to let me know! If you’re still freakin out about what to wear feel free to shoot me a pic or two of what you’re thinking, or we can create a little Pinterest board together! But overall, just wear what you’re comfortable in and feel like you in. A long flowy dress you just found at the D.I.? Great. A swimming suit to jump into the lake? Awesome. A hat and sunglasses that you are obsessed with? Perfect. You do you, and I promise the photos will turn out amazing because they are YOURS.